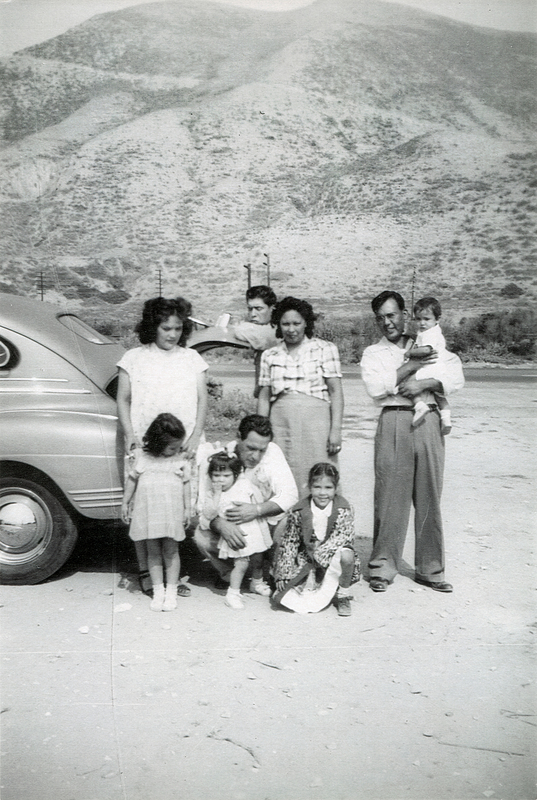 SCVHistory.com FF4902 | Tataviam Culture | Garcia-Romero Family Outing, Pacoima ~1950. 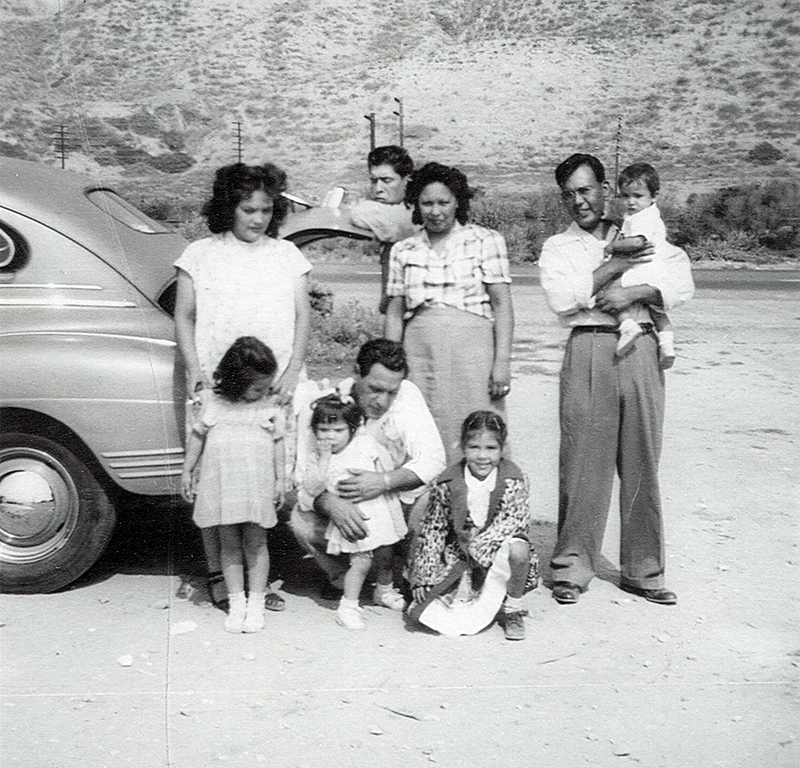 A Garcia-Romero family outing in Pacoima, ~1950. According to Geraldine Romero Perez (whose mother, Mary Louise Garcia Romero, at left, is pregnant with her), the family is en route to baptize Geraldine's sister Ernestine, who is in the arms of her godfather, Ted C. Garcia, at right. Ted's wife Ruby, standing next to him, is Ernestine's godmother. Back/top row, from left: Mary Louise Garcia (Romero), Harold E. "Sonny" Romero (leaning over trunk), Ruby (Garcia), Ted C. Garcia, Ernestine Louise Romero (infant). Front row, from left: Eleanor Marie Romero, Hearaldine Romero, Augustus Romero, Frances Garcia (later Hruska). Mary Louise Garcia Romero (Feb. 16, 1928 - May 12, 1999) is a daughter of Chief Mary Cooke Garcia (1901-1975) and Louis Garcia (1885-1973). Harold E. Romero is Mary Louise's husband. Augustus Romero is Harold's father. Ted C. Garcia (b. 7-10-1920) is a son of Chief Mary Cooke Garcia (1901-1975) and Louis Garcia (1885-1973). Ruby is Ted's wife. Frances Garcia is their eldest child. Ernestine Louise Romero (Oct. 23, 1949 - Dec. 4, 2009), Eleanor Marie Romero (March 14, 1946 - Feb. 28, 2009) and Hearaldine Romero (b. 1947) are children of Mary Louise Garcia Romero (1928-1999) and Harold E. Romero. Also, Ruby and Harold Romero are cousins; two cousins married a brother and sister (Ted C. Garcia and Mary Louise Garcia). Mary Louise Garcia (Romero) and her descendants, and Ted C. Garcia and his descendants, have ancestors who lived in the Santa Clarita Valley prior to European contact in 1769. FF4902: 9600 dpi jpeg from smaller jpeg courtesy of Geraldine Romero Perez.